Reporting your income to the IRS is important. Get the details on how to gather the right information. Each publisher is responsible for their own tax reporting. For your Mediavine earnings, you will only get a 1099 if you received a payment from a method other than PayPal. For the 2018 year, Mediavine paid out earnings via two payment services: PayPal Mass Payments (Jan - August) and Tipalti (Sept - Dec). Both of these have a different method for providing 1099s — please read on for details. As of September 1, 2018, Mediavine pays all publishers via Tipalti. This service allows users to choose their preferred payment method. Read more about the different payment methods here. Mediavine will issue a 1099-MISC for non-PayPal earnings paid out from September 1, 2018 to Dec. 31, 2018, and going forward, for publishers in the United States. These forms will be available via email in late January 2019 and will come from a service called Tax1099. From April 2016 to August 2018, Mediavine paid all publishers via PayPal Mass Payments. PayPal payments are covered under a completely separate section of the U.S. tax code. IRS Section 6050W applies to all payment providers, including PayPal. PayPal even gets its own special 1099 form, known as a 1099-K. Even including potential sponsored work, Mediavine publishers should only ever receive around 12 payments a year; far less than the 200 payments required to receive a 1099-K from PayPal. You do still need to report your Mediavine income to the IRS. Lack of a 1099 does not preclude you from that. 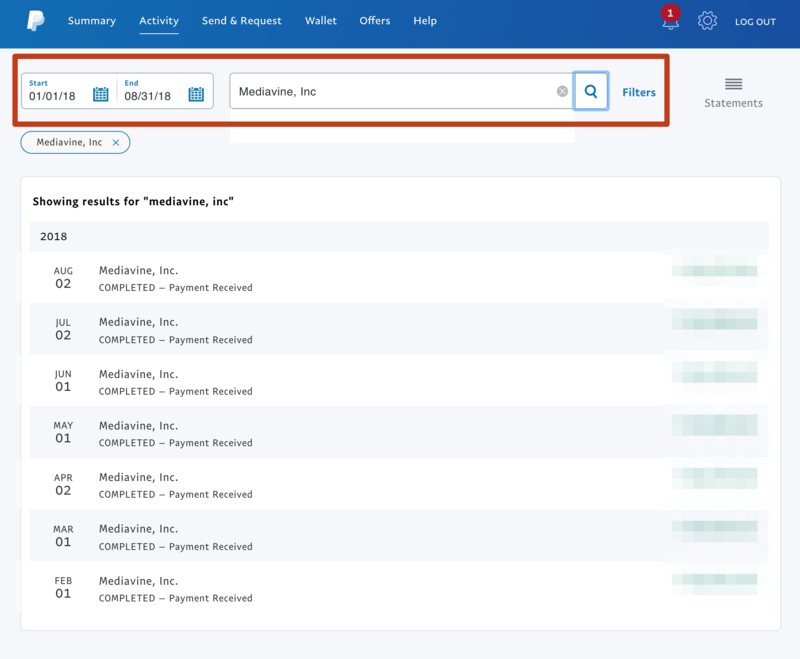 To get the income you need to report, simply log into PayPal, and click on the ACTIVITY tab at the top of the screen. Once there, you'll want to filter the activity. Change the dates to be for the entire year; ex: 1/1/2018 - 12/31/2018. Add an additional filter of "Mediavine, Inc" to the search. This will get you a list of all your Mediavine payments for the entire year. Print this page, and provide it to your accountant, or include it with your tax documents. It will suffice as proof of your income from Mediavine, Inc. for the year, in the same way a 1099 form would. No payments were issued in the calendar month of January 2018 because there were 13 payments issued in tax year 2017. Beginning in September 2018, payments were issued via our payment partner, Tipalti. If you chose PayPal as your method of payment through Tipalti, you can use the instructions above to pull a PayPal report to include with your tax documents. The date range would be 9/1/2018 - 12/31/2018 and the secondary filter is "Tipalti Inc". If you have any questions, please don't hesitate to reach out. You can email our support team at payments@mediavine.com.